117 S Irving Drive, Moore, OK.| MLS# 861654 | Oklahoma City Real Estate | Apple Realty, Inc. Owner Occupant purchasers utilizing FHA insured financing (including the FHA 203(k) Rehabilitation Program) could own this home for as little as $100 down. 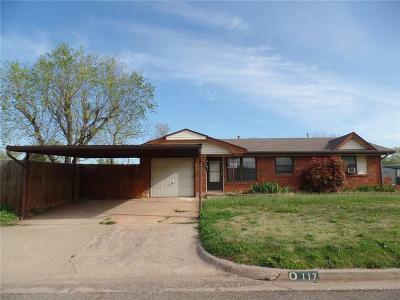 This home sits on a large corner lot with a carport, fenced in backyard, storage building, and storm cellar. Inside features built in book cases / media cabinet in the living room, the garage has been converted to a spacious dining room, the kitchen as lots of cabinets, and there's a large enclosed back porch perfect for plants or just socializing. Buyer(s) to verify property condition at their own expense as well as all public information including taxes, school districts, square footage, lot size, boundaries, assessments, and fees. HUD homes are sold in as-is condition. Buyer inspections are for information only. No repairs will be made by any party for any reason prior to closing. Exempt from disclosures/disclaimers. See the Property Listing Disclosure and Property Condition Report on HudHomeStore for all available information.